If you ask college admissions officers how they make decisions, most will tell you the first thing they look at is the rigor of the student’s curriculum. For selective colleges, this means Advanced Placement (AP) courses, which give high school students the opportunity to do college-level work. With competition for college admission increasing every year, many students fear they won’t be accepted without five or six AP courses, and when it comes to the most selective colleges, they are probably right. A student’s curriculum is evaluated in the context of her own high school, so if ten AP courses are offered and a student has only taken one, admissions officers at competitive colleges will wonder why. But if a high school only offers a couple of AP courses, students can’t be expected to take classes that don’t exist, and they would not be at a disadvantage in the admissions process. Students often earn an extra point in AP classes, making a “B” in an AP course equal to an “A” in a regular class when the high school GPA is calculated. Colleges may give special consideration to AP and honors courses in admissions decisions, but the way they treat these courses varies. Many colleges recalculate the GPA, and use an unweighted GPA. At every college information session, a parent will ask, “Is it better to get a “B” in an AP class or an “A” in a regular class?” The admissions officer answers, “It’s better to get an “A” in an AP class,” and everyone moans. It is true that students who are applying to the most prestigious schools need a stellar transcript, since the average GPA at admission to those schools is well over 4.0. But there are many fine schools that accept students who have just one or two AP courses and good but not great grades. students a head start on college credit, if they do well on AP exams. 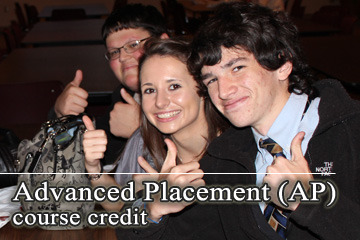 Most colleges award credit for scores of 4 or 5 on an AP exam, and some schools grant credit for a score of 3. A student who has taken five AP courses in high school could conceivably start college with a semester’s worth of credits. In theory, that student could graduate a semester early, saving thousands of dollars in tuition. But most students stay in college the whole four years, and use their AP credits to place out of introductory courses. Students also have the flexibility to double-major or take a lighter class schedule while doing an internship. math and science doesn’t need to suffer through AP Physics. students who also spend time discovering and pursuing their passions will be attractive to colleges.